Hello everyone! Just a quick post today to share details of some upcoming performances at festivals this August. 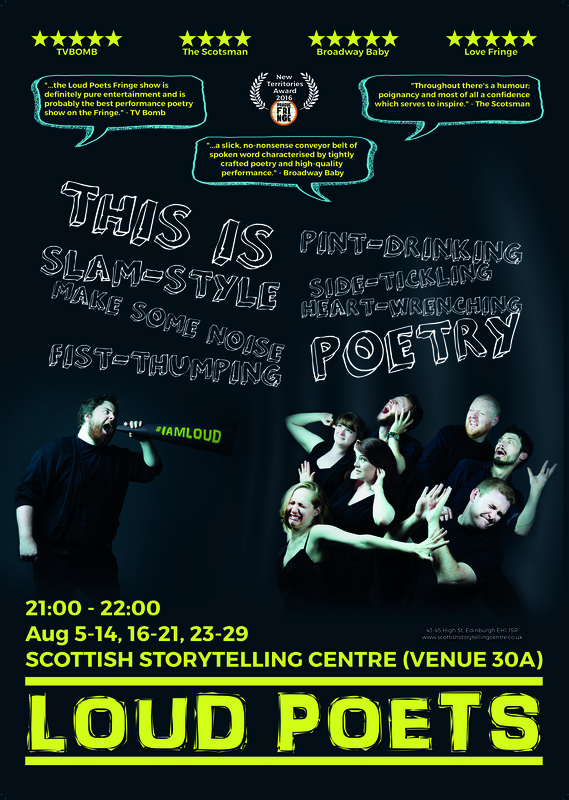 This August is the third annual Loud Poets run at the Edinburgh Festival Fringe, where we’re delighted to be returning to the Scottish Storytelling Centre on the Royal Mile. We’ve written an entirely new show for this year, on the theme of “making it loud.” Loud Poets has always performed off-book with a live band, but for this show we’ve really experimented with all the ways we can bring poetry off the page and combine it with other art forms to create a truly multi-medium experience. In addition to poetry and live music, there will be movement, dance, videography, audience interaction, and plenty of surprises. We’re really excited about this show, and can’t wait to share it with everyone. We’ll be performing Aug 5-14, 16-21, 23-29 at 9pm every night at the Storytelling Centre, with tickets at £10/£8 concession. There are two 2-for-1 tickets nights, on Aug 8 & 9, though these are selling out quickly so I’d recommend booking soon. Tickets and more information here. Although performing with Loud Poets will be taking up most of my time this August, I’m also delighted to be performing at two other festivals. On August 27 I’ll be performing on the Roar spoken word stage at the Stowed Out festival down in the Borders, alongside a great lineup – more information here. I’ll also be a featured performer at Flint & Pitch’s Unbound showcase at the Edinburgh International Book Festival on August 28 at 9pm – event page here. If you’re in Scotland, would be great to see you there!